There was a time when finance departments preferred on premises solutions. A time when long implementation times were still acceptable; extensions, patchings, and maintenance are expected to be done solely by the vendor and IT team; and a time when companies that struggle keeping up with the pace of the upgrade eventually end up almost implementing a new software just to be able to get a hold of the new features. This year 2018, many vendors and customers alike have realized that on premises solutions are not anymore the optimal choice for finance decision makers. CFOs and finance managers now want to optimize cost spending in terms of license costs, implementation costs, and the costs of keeping specific people to support or maintain the solution. Financial software solutions in the cloud present a good alternative because it has well touted benefits such as scalability, affordability, flexibility, instant availability, and manageability. Cloud-based financial software implementations require a great deal of preparation and solid understanding of what are expected to transpire and why. It is very crucial that finance departments and their decision makers fully understand the trends that lead to a need for change in technology so that their chosen financial software solution in the cloud can support their specific business needs. What is worthy to point out is that for those that have not prepared sufficiently for an implementation, they might find that the reality of cloud-based financial software implementations might be very different from what they had initially thought of. For starters, while most people spend a considerable amount of time looking for the “perfect” cloud-based financial software to help them with their end to end financial planning & analysis needs, technology is not the magic pill that will instantly address all pain points of the organization. Technology is only a part of the overall solution. There are other areas that are just as important as technology such as process, people, and configuration of the solution. 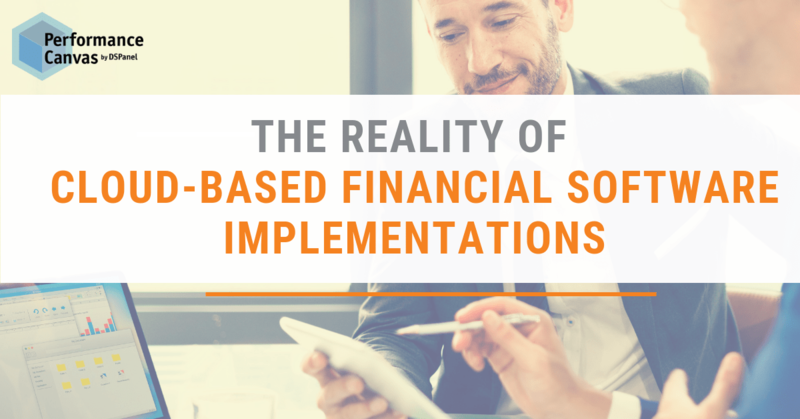 A cloud-based financial software implementation has a higher likelihood of succeeding if clear business requirements are mapped into the software features. It is not necessary to activate all features available in a software. What is more important is that the features that make sense for the business needs are activated. More importantly, no matter how good the chosen cloud-based financial technology is, if the organization still has a bad, unstreamlined process – technology alone cannot remedy that. Technology might make things faster but not necessarily better. This is why during an implementation, finance decision makers should also spend a significant time getting to know the implementation team. It is incumbent upon the cloud implementers to call out bad processes as they see it. Implementers should not only do what the customer pleases but they need to actually enforce the leading best practices in the financial arena in order to ensure a more efficient and effective process. They need to apply the lessons they have learned through years of trial and error in implementations and to understand that a project cannot be approached in a piece-meal fashion. It can only be approached holistically for the project to truly succeed and make a valuable contribution to the finance department. Another thing that always surprises some people during cloud implementation is the fact that they cannot customize cloud-based financial software in the same way they can with on premises. This is not to say that a customization is not possible because it is. The point is that too much customization should not be done because it will make automatic upgrades or maintenance roll out difficult. Many decision makers usually cry foul at this but there is logic to limiting the amount of customization that can be done in the cloud otherwise you lose some of the advantages of running your financial solution in the cloud. There are many other expectation vs reality scenarios that the Performance Canvas Financials team has learned through years of on premises and cloud deployments. If you want to know more about these and what finance decision makers usually regret or learn after an implementation, chat with our cloud FP&A experts by visiting www.performancecanvas.com or email info@dspanel.com to see a demo of our cloud-based software or to hear from our implementers on their experience with cloud deployments.